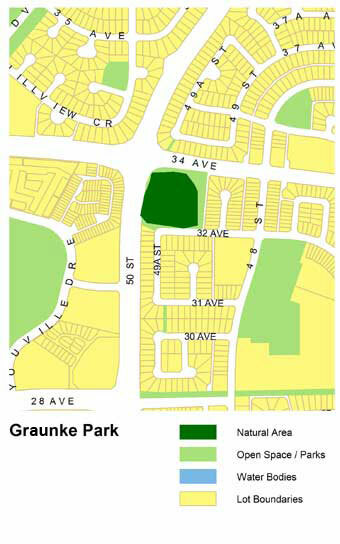 Graunke Park is a mixed-wood treestand consisting of aspen and balsam poplar intermixed with white spruce. A diverse understory of shrub and herb species provides habitat for many urban-adapted wildlife species. In an effort to preserve this special place in the community, the members of the Weinlos neighbourhood have implemented a Local Improvement Tax for the neighbourhood to ensure the preservation of this natural area. As a result, this treestand, complete with a small trail network, still exists for the use of wildlife and the enjoyment of the public. This natural area is located at the southeast corner of 50 Street and 34 Avenue. Parking can be found along the adjacent side streets and there is a walking trail within the interior of the treestand. The perimeter of the stand is also easily walked using sidewalks and abutting grassy areas. 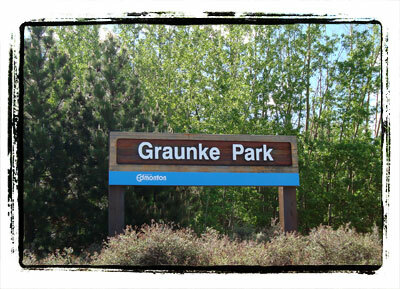 Graunke Park is an excellent example of an urban tableland forest exhibiting a diverse assemblage of vegetation species. Many urban-adapted species of birds and small mammals inhabit the site, use it for foraging, or as a stepping-stone to other areas. There are also a number of snag trees within the stand that provide habitat and foraging opportunities for cavity-nesting species.